SINGAPORE, Nov. 12 (Xinhua) -- China and Singapore agreed on Monday to upgrade their free trade agreement (FTA) and make more joint efforts to facilitate connectivity. 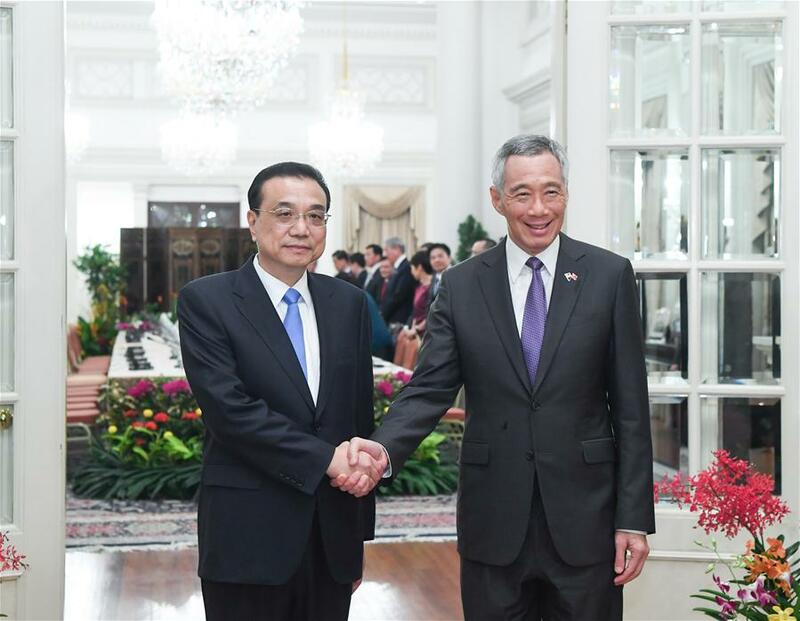 The consensus, along with agreements on boosting bilateral cooperation in innovation and other areas, was reached in talks here between visiting Chinese Premier Li Keqiang and Singaporean Prime Minister Lee Hsien Loong. Noting that China and Singapore have completed their FTA upgrading negotiations, Li said he hopes the two sides will seize the opportunity to lift two-way trade and investment to higher levels. The upgrade of the FTA will bring real benefits to the people and companies of the two countries and send a strong signal of further expanding trade and investment, Lee said. The two sides also pledged to advance the building of the New Land-Sea Corridor, which consists of a number of cargo routes by land and sea connecting central and southwest China to Southeast Asia, so as to further improve connectivity between the two countries and beyond. With the signing of a memorandum of understanding on the new logistics corridor, China and Singapore should build on the momentum and further boost two-way connectivity, Li said. The Singaporean leader said his country will join hands with China to build the new corridor so as to facilitate transport and trade between the two sides. Experts say the corridor will help China to further open up to the world while opening a shortcut for Southeast Asian countries to enter the Chinese market. Another substantial outcome of the visit, according to Li, is that China and Singapore have lifted the Guangzhou Knowledge City, an exemplary program in bilateral cooperation, to a national-level project. In their talks, Li said the two sides should actively expand cooperation in smart-city building, promote the upgrading of city management and artificial intelligence development, and mull new local-level collaboration. Lee said the Singaporean side is glad to see the upgrade of the project, and ready to step up smart-city cooperation with China. Intergovernmental cooperation projects between China and Singapore, such as the Suzhou Industrial Park and the Tianjin Eco-City, have yielded fruitful results. The upgrade of the Guangzhou Knowledge City project is expected to inject fresh momentum into bilateral practical cooperation. Also in their meeting, Li noted that as China's friendly neighbor and important partner, Singapore has been deeply involved in China's reform and opening-up. The two sides, he added, have consolidated political mutual trust, achieved fruitful results in practical cooperation, and become important trade and investment partners. Li recalled that China and Singapore established an all-round cooperative partnership progressing with the times when Chinese President Xi Jinping paid a state visit to the Southeast Asian country in 2015. "China is willing to strengthen communication and coordination with the Singaporean side, deepen mutually beneficial cooperation, and continuously bring bilateral ties to higher levels," Li said. After their talks, the two leaders witnessed the signing of a series of cooperation documents on FTA upgrading, connectivity, finance, science and technology, environment, culture and customs. During the first official visit to Singapore by a Chinese premier in 11 years, Li will also attend the 21st leaders' meeting between China and the Association of Southeast Asian Nations (ASEAN) and the 21st ASEAN-China, Japan and South Korea leaders' meeting, respectively known as 10+1 and 10+3, as well as the 13th East Asia Summit.